Learn more about Spacial Forces from Palma Blank. One of only 15 that will ever be made. Once it’s sold out, it’s gone forever. Palma's bold, geometric compositions buzz with the energy of the vivid, often neon, colors she employs. She brings a distinctly contemporary sensibility to the history of abstract painting through works that reference today's technical and athletic equipment and clothing. Palma Blank paints bold, geometric compositions that concurrently explore the boundaries of the canvas while embodying the linear structure of the canvas. 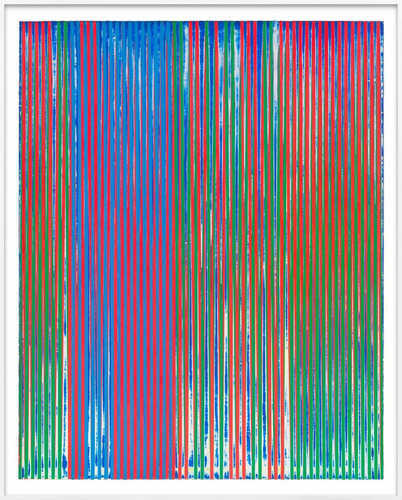 Palma invites viewers to more closely examine the stripes in her work to discover the various, subtle structures present. Through her work, she seeks to complicate Frank Stella’s quip, “what you see is what you see” by creating shifting optical effects that lend energy and life to her neon compositions. Palma was born in Norwalk, Connecticut and now resides in Brooklyn, New York. She received her BFA from Rhode Island School of Design, and went on to attend Yale University where she received her MFA. She has participated in numerous exhibitions throughout New York.